[The text here is from Chapter 6 of Pradip Das's Henry Irwin and the Indo-Saracenic Movement Reconsidered (New Delhi: Partridge, 2014), selections from which the author has very kindly shared with us. This version has edited and formatted for our website by Jacqueline Banerjee, who has added headings, link and captions, and, with some help from the author, and as far as possible, indicated the various sources. The book is illustrated, but, for copyright reasons, modern photographs here are taken either from Wikipedia or from our own website. The former are available, with attribution, under the Creative Commons Licence. The latter are by the present editor: you may reuse these too without prior permission for any scholarly or educational purpose as long as you (1) credit the photographer and (2) link your document to this URL or cite the Victorian Web in a print document. Click on all the images to enlarge them, and, in the case of the latter, for more information. Bibliographical information appears in the form of in-text citations, which refer to the bibliography given below in this side column. Chattopadhyay, Swati. Representing Calcutta: Modernity, Nationalism and the Colonial Uncanny. London: Routledge, 2006. See especially the introduction and chapter 2. Doig, Desmond. Calcutta: An Artist's Impression. Calcutta: The Statesman/Commercial Printing Press, .See Chapters 2, 19, 28 and 29. This coffee table type book has no page numbers. Each chapter is about one page with a corresponding pen and ink sketch on the right. Fergusson, James. History of Indian and Eastern Architecture. London: John Murray, 1891. Internet Archive. Contributed by Harvard University. Web. 29 January 2015. Muthiah, S. Madras Rediscovered: A Historical Guide to Looking Ahead. Chennai: Westland, 2008. Pieris, Anoma. "THe Trouser under the Cloth: Personal Space in Colonial-Modern Ceylon." In Scriver and Vikramaditya Prakash, eds. Colonial Modernities: Building, Dwelling and Architecture in British India and Ceylon. London: Routledge, 2007. 199-218. Roberts, Emma. Scenes and Characteristics of Hindostan, with sketches of Anglo-Indian society. Vol I. 3 Vols. London: Allen, 1835. Internet Archive. Contributed by the University of Oxford. Web. 29 January 2015. Scriver, Peter. "Empire Building and Thinking in the Public Works Department of British India." In Scriver and Vikramaditya Prakash, eds. Colonial Modernities: Building, Dwelling and Architecture in British India and Ceylon. London: Routledge, 2007. 69-92. Smith, T. Roger. "Architectural Art in India." Journal of the Society of Arts. Vol. 21 (7 March 1873). The present editor has not been able to consult this source to give page citations. Sriram, V. "The Man Who Owned 99 Homes in Madras (article dated 5 April 2012). The Journalistic History of Madras. Web. 22 January 2015. Suraiya, Jug. Calcutta. Calcutta: Oxford & IBH, 1985. Tillotson, Giles. "Architectural Styles in British India, 1837-1910." MARG. Vol 46. 1 (1994). The present editor has not been able to consult this source to give page citations. Tindall, Gillian. City of Gold:The Biography of Bombay. New Delhi: Penguin, 1992. Metcalf, Thomas. An Imperial Vision: Indian Architecture and Britain's Raj Berkeley: University of California Press, 1989. _____. "A Tradition Created: Indo-Saracenic Architecture under the Raj." History Today. Vol. 32, No. 9 (1982). Available on the web by subscription. The engineer dominated Public Works Department, which Irwin represented had, by this time, run dry of designs other than the purely utilitarian. As the quintessential engineer turned architect, it made sense to use these designs as basic infrastructures to which domes and minarets could be added to give them an "oriental" look. The PWD was an essentially British institutionalised agency specialising in the building of law courts, government offices, schools, colleges, clubs railway stations police stations, jails, cantonments and many other such structures which would help project British dominance over civil society at the time. However there were other considerations. James Fergusson, whose History of Indian and Eastern Architecture (1876) is considered to be the first comprehensive account of the growth and development of Indian architecture, outlined a theory which sought to divide Indian building traditions and patterns based on religious and racial divisions. In his view, there were distinct differences between the Aryan/Dravidian and Sanskritic/non Sanskritic cultures. These accounted for the stylistic variations between "Hindu" and "Muhammedan" architecture and, to quote Fergusson, "the intellectual status" of the South Indians "is and always was mediocre" (341). According to him, "in the south civil architecture as a fine art is quite extinct and though sacred architecture still survives in a certain queer, quaint form of temple building, it is of so low a type that it would hardly be a matter of regret if it, too, ceased to exist, and the curtain dropped over the graves of both, as they are arts that practically have become extinct"(385). Therefore, Fergusson argued, the decisive marker of Indian architectural antiquity was its Aryan or North Indian racial pedigree. Another pioneer of the movement, Sir William Emerson, argued in favour of Islamic architecture as well adapted to the Indian context. To add insult to injury for the South Indians, the term Indo-Saracenic — a style subsequently initiated by [the company engineer Paul] Benfield, Chisholm and Irwin — was used to reflect and vindicate that pedigree. It was inappropriate to say the least: the Saracens, a tribe in Arabia outside the pale of European and/or Mughal influence had no relevance to India. In the context of Mughal architecture the description was simplistic if not distinctly derisive. British colonial engineers obviously acquiesced in these uninformed and outlandish views, and the absence of any recorded treatises of South India's secular Hindu vernacular architectural heritage helped. Other than the great temple complexes which were the equivalent of public buildings in medieval India, civil life revolved round these complexes and royal palaces. Residential buildings like the Agraharams, incorporating verandahs and courtyards, were few and far between. Additionally, Irwin's South Indian associates had no contribution to make to the debate. They chose to remain silent and accepted to share the white man's views provided it brought material benefits. An Indian master builder of the time, a close associate of Irwin, Thattikonda Namberumal Chetty, acquired as many as ninety nine properties in his lifetime. In the manner set by his mentor, Chetty had a stable with fine horses and was the first Indian to own a motor car. Many more honours came his way, such as titles like Rao Sahib and Dewan Bahadur not to speak of membership of the Madras Legislative Council and a Bank Directorship (see Sriram). Henry Irwin's name is associated with a number of monuments in old Madras, not all of them beautiful or spectacular, but they represent a period of Indian architectural history. They were a novelty, and reflected the incapability of their designers to assimilate the ethos of prior historic models. Given the stylistic limitations of hybridity, the risks inherent in such projects for persons like Irwin, without formal architectural training, were formidable. The new colonial builders and their Indian associates genuinely believed that by enhancing the physical configuration of the built environment, social and moral improvement of the subject race was possible. The rhetoric of cultural commitment gave the movement sufficient impetus to warrant public interest. All that can be said about these buildings is that the concept was an ingenious, if unrealistic one. 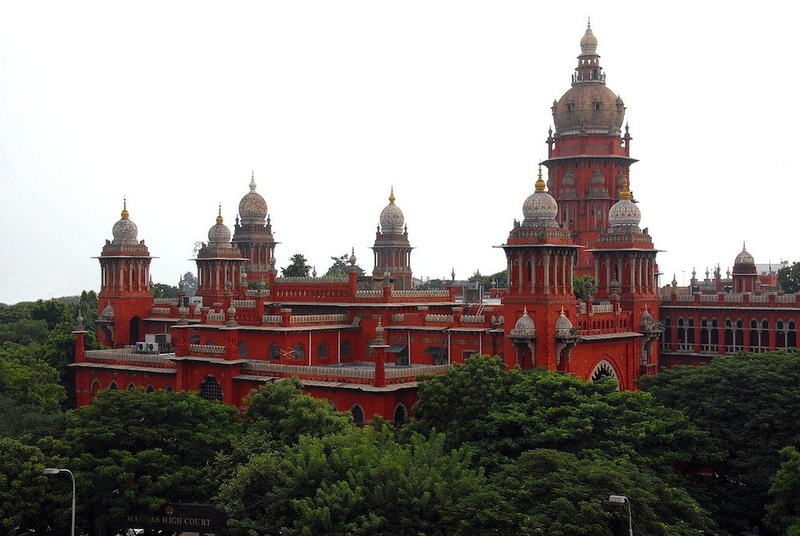 Madras High Court, designed originally by J.W. Brassington, but completed by Henry Irwin, with J.H. Stephens as his engineer. Contributed to Wikipedia by Yoga Balagi under the terms of the Creative Commons Licence. In 1889 Irwin undertook his first project in Madras — The High Court and Law College, displayed on the cover of this book. Irwin needed to share the distinction with one J. N. Brassington, who is supposed to have prepared the original designs. However, the construction was entrusted to Namberumal Chetty under the supervision of Engineer J.H. Stephen. With their high ceilings, ornamental tiling, stained-glass arches, grillework and tall minaret (possibly the tallest in Madras), they have been described as "beautiful" and "imposing" (Muthiah 266). A less enthusiastic observer commented that they were "comparatively pedestrian" with the "painted brickwork and massing of this enormous range following the Public Works Department's standard utilitarian formula" except for the towers and roofline which helped to turn them "Oriental." In 1894. a powerful flashing light was installed on the minaret to act as the city's third lighthouse. The winding open staircase to access the lamp was perhaps a little uncharitably described by the same commentator as "disturbingly reminiscent of a Piranesi dungeon" (see Tillotson). Next door to the courts stood the Law College, and every traveller arriving by sea to Madras saw the buildings before they disembarked, for they stood on the Esplanade a little away from the docks: and with their multitudinous towers, pinnacles and domes, some brightly coloured, some decorated in stucco patterns, they presented a terrifically fanciful welcome to the city, in grandiose partnership with the classical restraint of Fort St George along the foreshore. Morris comments also on the "contrapuntal" and "cryptlike" surprises in the building "court after court, staircase after staircase, warrens of vaulted corridors, half hidden alcoves where the lawyers gossiped and huge verandahs...," concluding her observations by remarking that the last "symbolic construction" by Messrs Irwin and Stephens was a "bulbous and eccentric tower" with "an unsuitably phallic look" (114). The original Connemara Library, now a Museum. It developed as part of the Pantheon Complex. The semi-circular theatre adjoined the main reading room, which is not seen. Nor is the rather unimaginative Indo-Saracenic tower in the background, hidden by a clump of trees (Das). This photograph was contributed to Wikipedia by L.vivian.richard. Another Irwin project was to develop the complex known as the Pantheon, a name derived from their earlier use as the "Public Assembly Rooms," where among others, Cornwallis and Wellesley were feted following their respective victories over Tipu Sultan (1799) and the Marathas at Assaye (1803). The complex was originally a place of public entertainment and balls and subsequently rechristened the "Collector's Cutchery." It houses an old museum described in various travel guides as a "red-brick rotunda surrounded by an Italianate arcade" and the well known Connemara Library. Connemara, a philanderer of sorts, was something of a controversial figure and did not perhaps deserve to be remembered in this way. At any rate the library was formally opened in 1896. It was built by Namberumal Chetty, but the "interior flourishes" — the ornamental wooden ceiling, copies of antique wooden furniture, and mullioned windows and superimposed ornamental columns reminiscent of English Tudor/Elizabethan/Jacobean elements — were fashioned by Irwin (Muthiah 363). Around this time Irwin also began work on the headquarters of the Imperial Bank of India (now the State Bank of India) in company with Namberumal Chetty, in the same mixture of styles, and the new functional and decorative Egmore Station, incorporating traditional Tamil motifs with typical 19th century arches and vaulted roofs, with Master builder T. Samynada Pillai. The Irwin Pavilion at the Madras Cricket Club (since demolished) and a Gujarati Jeweller's showroom on Mount Road (Anna Salai), also since demolished, were his other projects. Once again Namberumal Chetty was the principal contractor and builder. Victoria Memorial Hall, now the Art Gallery of Madras, built by Irwin 1886-1890. Photograph contributed to Wikipedia by Jungionier. The perspective has been corrected. 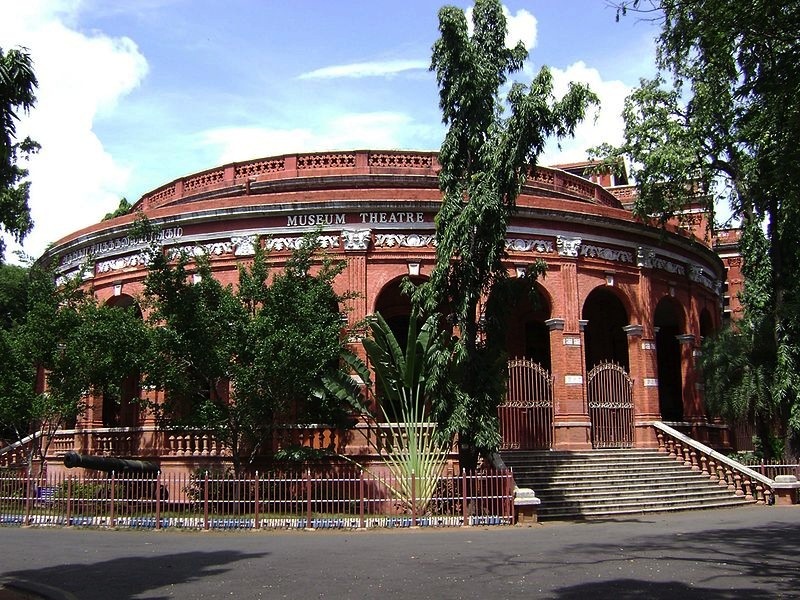 One of Irwin's best recognised works was of course the Victoria Memorial Hall designed first as the headquarters of the Victoria Technical Institute and now known as the Art Gallery in Madras (1907). 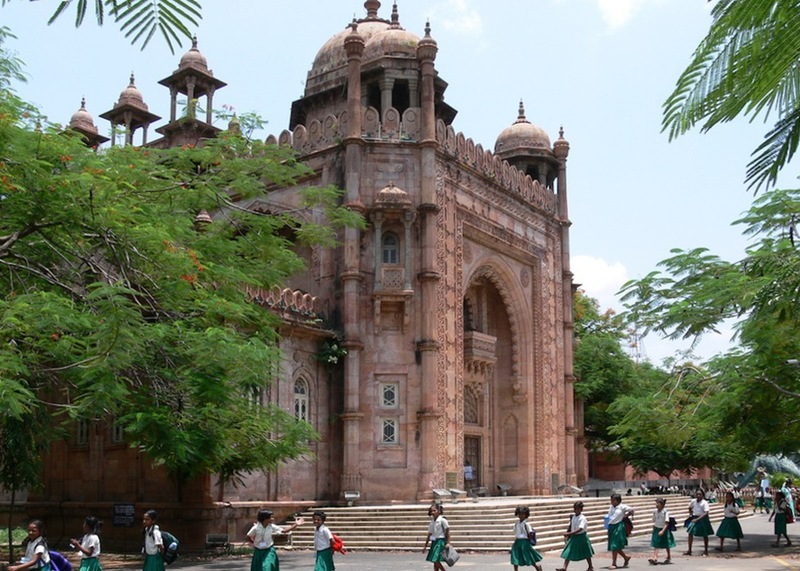 Not to be confused with colonial Calcutta's Victoria Memorial, it incorporates a façade borrowed from Akbar's Buland Darwaza at Fatehpur Sikri. The building was a faithful copy in miniature of that spectacular Mughal monument, complete with scalloped battlements, slim minarets and chhatris and built with the red sandstone of North India. The difference was that like most other PWD constructions the building was set up on an elevated plinth with a brick and mortar framework to imitate the high ridge on which the original stands. It was built to honour Queen Victoria on her Golden Jubilee but apart from serving a political purpose, the building was strangely out of place in Dravidian Tamil Nadu. Akbar never ruled South India. His Buland Darwaza was built to commemorate the Mughal Emperor's victory over Gujerat. The original Buland Darwaza or Victory Gate with its Quranic inscriptions, a major tourist attraction for visitors to Fatehpur Sikri, opens out into the courtyard of Akbar's capital city and its mosque. While Irwin's attention to detail in creating a near-identical copy was commendable and doubtless found favour with his employers, it was certainly not an example of creative excellence or originality. Comparisons have been drawn between the public buildings of colonial Madras, and Calcutta. A few examples to illustrate the essentials should suffice to highlight the differences. Calcutta was basically an extension of the Sunderbans. It was a city described by early travellers like William Hodges as "a collection of handsome buildings, on a mud flat surrounded by gardens. Others like Lord Valentia and Maria Graham remarked that it was "an entire village of palaces" and indeed on the general appearance of "grandeur" in all its buildings." Poets too extolled the virtues of the city, describing Calcutta as "the pomp of spires and palaces" or "the little London in Bengal…a wonder formed like island on the main, amidst a sea of pagans." In an age when there were no cameras, the only recorded evidence of these observations were the work of a large number of British landscape artists who started coming to India in the last quarter of the 18th century, notably painters like William Hodges, Thomas and William Daniell, James Moffat, Francois Solvyns, Charles Doyly, James Bailley Fraser, William Havell, William Prinsep, George Chinnery and many others. Their drawings vividly captured the polished white Palladian buildings of Calcutta with flat or balustraded roofs, set against a clear blue cloudless sky, merchant ships sailing up the Hooghly and the dark green vegetation of the city — a combination totally new to an Englishman accustomed to the damp and fog of his native country. Two styles of architecture in Kolkata: Left: Prinsep Ghat, by Captain W. Fitzgerald, 1843 scroll down the linked webpage to see this picture in context). Right: The High Court, by Walter B. Granville (1819-74), completed 1872. It will be obvious from the foregoing that much of Calcutta's architecture, particularly in the White Town, consisted of imitation Neo-Classical or Palladian styles popular in England during that period. In 18th century Calcutta, as it is today in Mumbai and elsewhere, landed property was a lucrative business. Building costs were high, as basic building materials like brick stone and durable wood had to be imported from outside the city. Consequently rents were exorbitant and "pukka" (masonry) buildings were fruitful investments. Only a few wealthy inhabitants could afford the luxury of a large house in a spacious garden. There was no dearth of these among the British merchants who according to the Calcutta Gazette of 1806 made immense fortunes by the purchase and sale of expensive artefacts like jewelled armour, Arab stallions, European-built coaches, engravings, paintings and expensive furniture. As English women were a rarity in India at the time it was also common practice for a European bachelor to take on a Eurasian or an Indian mistress on arrival in Calcutta. There are stories of "horses, carriages, palanquins" (Roberts 16) and whole housefuls of servants and retainers to attend to the new arrival. Such were the symbols of gentility if not also a necessary part of it. It will be appreciated that many of these mansions served as offices and private residences. The "British obsession with classification, division, and separation" led to "elaborate artifices of delimitation" such as wrought iron railings and gates, masonry walls and elaborate gateways as an extension of the architecture of the main building (Chattopadhyay 91-92). They functioned as preparatory devices of what was to be found inside — more often than not, a house with pillared verandahs, a flat roof surrounded by a light collonaded balustrade and a front relieved by a deep portico supported by lofty columns. "The buildings, with rare exceptions, were oriented with their long axes running north-south allowing for carriage ports to the north and verandahs on the south to catch the summer breeze," while internal layouts differed: they "typically consisted of three sets of rooms, one set on the axis with the carriage-port and south verandah and two sets of rooms on either side, thus creating a three bay pattern" (Chattopadhyay 94). In the colonial house, Swati Chattopadhyay continues: "The hall was the principal entrance and gathering space" (95). Due to the scarcity of public places for accommodation and recreation, there was a need to provide for large gatherings. Typically "[b]reakfasts brought 15 people to the table, and dinner 25" (Chattopadhyay 123). In fact, contrary to their British counterparts, all of the spaces in earlier colonial Calcutta houses had multiple uses. "It was a method of responding to a changing market in which there was no assurance that the building would continue in its present use" (Chattopadhyay 96). Raj Bhavan, or Government House, Kolkata, 1799, by Charles Wyatt (1758-1819). Mention has already been made of Calcutta's Government House, built by the Marquis of Wellesley after John Adams' design of Kedleston Hall in England.One of Calcutta's first public buildings, the Town Hall, a structure described by the British columnist Desmond Doig as "a building of generous and elegant proportions" was built in the Neo-Classical style by one John Garstin a Colonel in the Corps of British Engineers in 1813. Belvedere House (now the National Library) was built in the Italian Renaissance style. 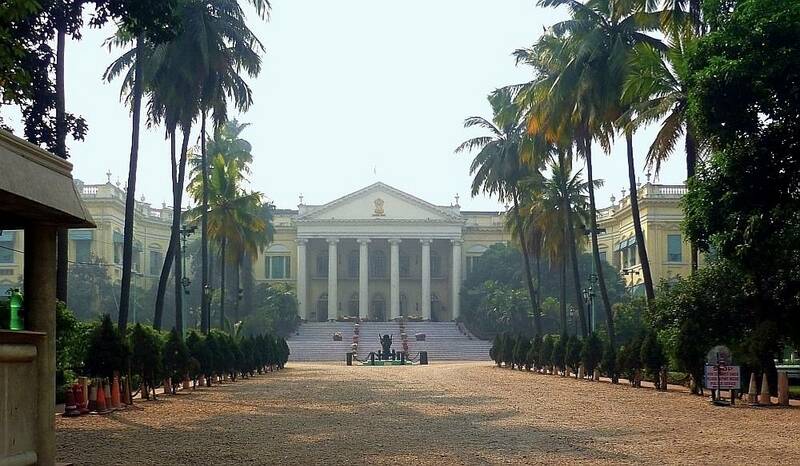 From 1769 it became the country seat of the British Governors of Bengal and later, the winter residence of visiting Viceroys to Calcutta. The well known Boys' School, La Martiniere, had a dome supported by Corinthian pillars which once housed a chapel, consecrated in 1836. Hastings House in Alipore. Calcutta's General Post Office, Prinsep Ghat, Metcalfe Hall, the Asiatic Society and many more, were all a part of the Palladian or British Neo-Classical architectural style popular in the period. Fort William itself boasted of fine buildings in that style, namely the house occupied by Lord Kitchener of Khartoum and the old Government House. Calcutta also had its share of hybrid buildings. Indian imitations of these mansions until well into the 19th century were a mixture of styles. For want of a better terminology they were derided as "Ballygunge Baroque" or "Shyambazar Victoriana". They indicate that regardless of proportions, the new language of neo classicism was adopted (a) because it was fashionable and (b) because the Bengali elite were eager to follow their political superiors. 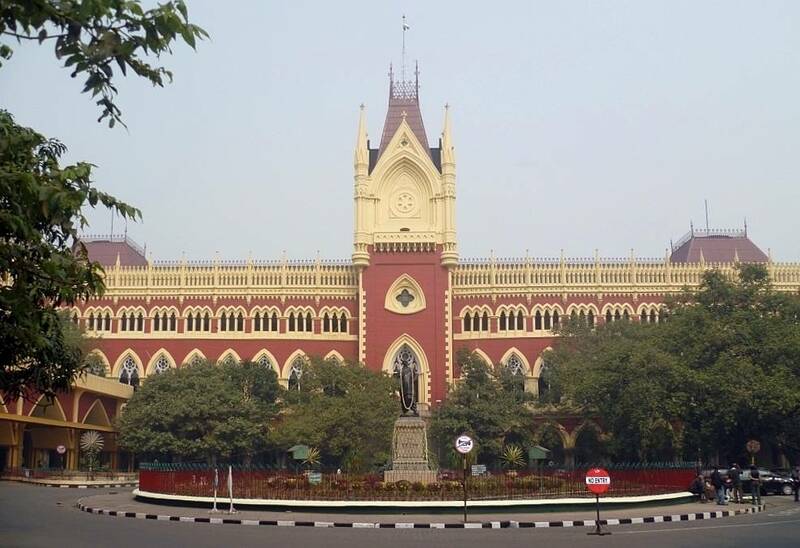 Besides, Calcutta's High Court, for instance, a replica it is said (e.g. by Suraiya 19), of the Staad-Haus at Ypres, boasts a tall belfry, pointed Moorish arches and foliated pillars. It stands in stark contrast to the Town Hall next door. Like some of Madras' heritage buildings, it has been vandalised by contractors who believe that they have added "improvements" to the original. The red brick sprawl of the Sir Stuart Hogg Market (better known as the New Market) is representative of late Victorian architecture complete with Victorian wrought iron beams and a timeless Clock tower reminiscent of some Indo-Saracenic buidings in South India, like the Moore Market. Likewise, there were elements of hybridity — some quite bizarre — in many of Calcutta's prominent landmarks, built by the Tagore family, like the Tagore Castle with turrets, which remind us of Balmoral or the Baitakkhana designed by a French architect or Vijay Manzil the Calcutta residence of the Maharajas of Burdwan a combination of "Gothic, Corinthian, Colonial and Mackintosh Burn" (Doig, n.p.). All of these contributed to the architecture of the city until the British decided to shift their capital to New Delhi in 1911. The Bombay comparison is even more curious. The rivalry between Calcutta and Bombay, the two outposts of Empire was reflected in entirely different architectural styles. The latter-- its public buildings a strange concoction of Moorish domes and Gothic, jumbled with pitched roofs, Victorian buttresses, gargoyles and turrets — have drawn both admiration and severe criticism, very often leaving informed visitors wondering about the extent of Bombay's "Westernisation." Unlike Calcutta, many British residential bungalows of Bombay were, in the initial years, made of wood. Some drew their inspiration from "the many-tiered wooden Gujerati house" of which Bombay can still provide examples (Tindall 13). Garden houses, not necessarily in the grand manner of Calcutta, first began to appear in the 18th century as suburban European bungalows set among "the shore plantations north of the Esplanade, on the old Mazagaon estate and along the shore of Back Bay" (Tindall 86). These borrowed styles from Medieval European cities like overhanging wooden balconies and projecting eaves. The result of all these closely built wooden houses was of course the disastrous fire of 1803 which accounted for their eventual disappearance (again, see Tindall 86). One of the reasons why Bombay was so different was that it was never a full-fledged colonial city like Calcutta. Its Anglo-Indian infrastructure was geared mainly to meet a "floating population" of Europeans who used Bombay as a stopping-off point on their way to other parts of India and/or to strike commercial deals, not excluding its shipyards, which under the stewardship of Parsees like Jamshetji Bomanji Wadia supplied warships of "unbeatable quality" to the British Government such as the ones that fought at the Battle of Trafalgar (see Tindall 190, 68). Overall, the Madras experiment, like other architectural fantasies of the period, was an exercise in invoking popular support for an alien government while at the same time imposing an unmistakably English flavour on these creations. Those among the local population who were given the opportunity of serving the colonial administration in postions of privilege were suitably brainwashed to function as interpreters of European values. Unfortunately these attitudes persist. It may be some years before they can be discarded in favour of an appropriate secular domestic and public architecture "culturally rooted but politically neutral Eastern tradition" (Pieris 217). The other question which comes to mind is how many people actually notice their architectural surroundings. I have not come across many Indians who do and certainly none who question the credentials of their creators or their motivations. The architectural history of Colonial India is replete with gushing descriptions by locals of the creations of the ruling power. Ironically, we seem to have left critical thinking and analysis about these creations to others. The work of those Indians who in the last ten years have made it their business to carve a niche for themselves in this emerging space of architectural inquiry therefore, deserve to be carried with acclaim.